What sets Hopkins Nurses apart is their particularly high level of competency, bringing valuable knowledge and insights to their work, and advocating for patients whether it’s at the bedside or giving congressional testimony. They are uniquely skilled at seeing the big picture yet never forgetting the healing power of a single touch. What Makes a Hopkins Nurse? Whether by the bedside, in community clinic, administration, research, teaching or policy reform, Hopkins Nurses are committed to making the world a better place. I learned at Johns Hopkins that you have to pay it forward and be a positive influence for future generations of Johns Hopkins Nurses. 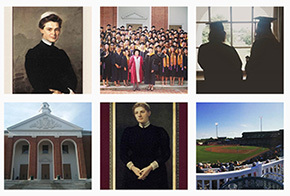 You can help secure nursing’s future at Johns Hopkins. We seek to redefine nursing education through a unique combination of academic rigor, extroadinary nursing scholarship and unparalleled opportunities for nursing graduates. When you make a charitable gift to the school, you will receive the satisfaction of supporting an important cause. Reconnect with old classmates, expand your professional network, and explore the Johns Hopkins Alumni Community all in one place! Nominations are welcome for alumni who have distinguished themselves in one of the award categories offered. Find out what's new at the Johns Hopkins University School of Nursing. Connect with other university students, faculty, staff and more using the social media networks below.